The Obama Administration on Tuesday detailed a plan to save the honeybee and monarch butterfly populations, mainly by adding or improving seven million acres of land "devoted to the wildflowers and milkweed that are crucial to their survival," Michael Wines reports for The New York Times. 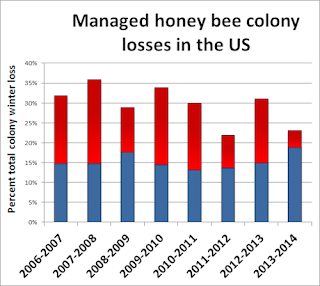 Honeybee populations lost 42.1 percent of colonies last year, while the monarch butterfly population has fallen by 90 percent in recent years. The plan "aims to cut annual honeybee losses to 15 percent of colonies—roughly the average in earlier decades—by 2025," Wines writes. "For monarchs, the goal is to build by 2020 a migration large enough to cover 15 acres—or about 20 football fields—of the Mexico forest where the butterflies spend the winter. Last winter the monarchs occupied about 2.8 acres of forest." Efforts would focus on the central U.S., "where about two-thirds of the nation’s managed honeybee colonies spend the summer and where monarchs conduct their annual migrations to and from Mexico," Wines writes. "It would include encouraging schools to plant pollinator gardens and turning land around Interstate 35, which runs from Duluth, Minn., to the Mexico border at Laredo, Tex., into a continuous wildflower buffet for migrating monarchs and other pollinating creatures." Also, "federal agencies like the Bureau of Land Management and the Defense Department would include pollinator habitats in their management of government property, whether in restoring fire-damaged forests or landscaping a new office building," Wines writes. "Federal officials would encourage state highway and utility offices to plant wildflowers and milkweed along rights of way instead of planting and mowing grass. Among other initiatives, the strategy will modestly increase funding for research into bees and other pollinators, expand public education and study ways to minimize pollinators’ exposure to pesticides." Environmental groups said the plan doesn't go far enough to address pesticides, which have been partially blamed for the declines, Wines writes.